Celebrity Style Capture: Kim K.
Style Notes: I got the Ashley Stewart boots in a size 11W, for me they were true to size. 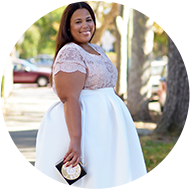 The skirt was purchases in a size 22. The skirt is a tight knit and only has a little give. It's not stretchy. The top was purchased in an XL, but ran small. If you are over a small busted 16 or 18, I wouldn't purchase, I would just replace with a white tank.